For the first time ever, somebody said to me "I'm reading that book too!" Except at SF conventions, I've rarely met anyone who's read any of the same books as me, never mind at the same time. 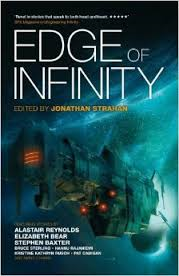 I was reading the Jonathan Strahan anthology Edge of Infinity on the flight from Dublin when the stewardess checking we were all strapped in saw the book and made the comment. I think everyone else on the flight was reading various volumes of Game of Thrones!